Rebecca woke in the early morning hours to labor pains. She had made arrangements for Grace to come stay with the girls so they could stay in their beds. She didn’t want to disturb their sleep; despite her best of intentions though, as she kissed Elodie goodbye, she couldn’t help but feel like a sneak in the night, and that perhaps Elodie wouldn’t understand her Mom’s absence come the morning. They had just celebrated her first Gotcha Day with her in September, and it didn’t seem like she’d had enough time as the baby of the family. Logically, she knew it would work out, because things always do, but a guilty conscience laid a burden on her as she left Elodie slumbering in her crib, unaware of all the changes that were brewing in the night. Downstairs, Quint was on the phone calling the hospital to let them know they were coming in. He had left the hospital three years ago, but still kept up with the hospital staff; they were all looking forward to delivering his baby. Rebecca was relieved that Grace had arrived while she’d been upstairs tucking the girls in. She didn’t want to sit on her hands, waiting for her, with all the worries running through her mind. “You’re going to have a baby today, finally meet this little one.” Grace was full of exhilaration that it eased Rebecca’s nerves. It helped to focus on this baby instead of the two asleep upstairs. Quint was saying goodbye on the phone, then came to join them, wrapping his arms around Rebecca’s stomach. “You ready to meet our son?” An impish grin playing at the corners of his mouth. “Or daughter.” Rebecca rolled her eyes towards Grace, and they laughed for a moment, before abruptly stopping. “Well, I guess we should go then.” Rebecca bit onto her lip, fighting off the emotion that stabbed at her heart. One of Quint’s old work buddies was outside at the emergency entrance waiting their arrival with a wheelchair in front of him. As much as Rebecca protested, he insisted, and she relented. She regretted not eating that ice cream before bed, she wasn’t looking forward to a long labor that kept her from sleep and allowed only ice chips. But it turned out that delivery the second time around wasn’t as drawn out of a process as it was with the first. By the time the monitor was set up to keep an eye on the baby’s heart rate and contractions, and Dr. Morgan finally made rounds, it was already time to push. Dr. Morgan seemed surprised at the speed, but Rebecca was grateful, she wanted the baby here, and the girls visiting first thing in the morning. Just before four in the morning, Dr. Morgan announced that they had a son, and as his cries filled the room, Quint began to cry and laugh simultaneously. “Told you it was a boy, I told you.” He came over, kissing Rebecca on the forehead in a frenzy of emotion. They took turns holding Wyatt until the sun was beginning to rise, and the adrenaline of the delivery, and the high of a healthy baby, began to wear off into exhaustion. “You rest, I’ve got him.” Rebecca fell back onto the bed, when she perked up suddenly with a panic in her eye, he put up a gentle hand. “I’ll text Grace, and tell her to bring the girls immediately after breakfast.” Relief washed over her face, and she climbed the rest of the way into the bed. True to his word, Grace was summoned to bring the girls down to meet their baby brother as soon as they had gotten ready. Scarlett warmed up to Wyatt immediately, it had been years of wanting a sibling, to a sudden whirlwind where she gained two in just over a year, and she had no complaints. She might have been disappointed in Wyatt being a boy originally, but now that she had Elodie as a little sister, she was perfectly excited to have a baby brother too. Elodie clung onto Grace when they introduced Wyatt to her, anxious by the unknown. Rebecca felt certain that once she was back home with her, that she would warm up to having a baby in the house. Also delivering in December was Caroline and Reed Welsh, welcoming their third baby, Toby Welsh to the family. Eva and Gideon Prince are in their final month of pregnancy, welcoming their first child together in January. Pregnancy agreed with Eva more when she was in her mid-forties, and with her girls getting so old, she feels partly crazy to be starting over with a new baby. The nursery is all prepared, Gideon couldn’t wait until the baby arrived to see what they had; it didn’t help that she worked at Mini-Sprout, the only baby store around. He started coming in regularly once her third trimester hit. Eva is not sure she’d know how to raise a boy, so she’s hoping for a girl, just for ease in familiarity. Grace and Benjamin Andersen are four months along and due in May, and she’s hoping that this baby will not be as much of a handful as her little Isla; she’s pretty certain she can only handle one with that much spirit. Eva’s youngest daughter Linnea is joining the teenage ranks. She’s not very interested in the new baby to arrive in a month, she’s much more interested in hanging out with her big sister Paloma in the city, and reading the latest fashion magazines. Also starting her teenage years is Mayor Cole and Lucy London‘s daughter Itzel. She’s painfully shy, but is hopeful that she can make a stronger presence during high school. 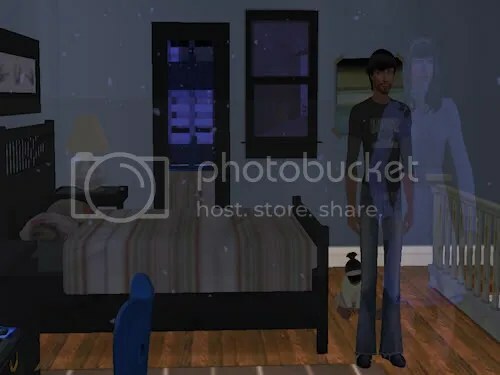 Notes: I cannot believe that I am posting a real update, with pictures, and sims! I sat down to write this update, and forgot how to do it all. Feels good to be back, I haven’t redecorated South Port at all; I really just want to hide in Millwood because it was easy to decorate, and just avoid the city. But alas every single update that remains for this round takes place in South Port. So I will buck up, and carry on. Onto the update! I was super glad that Rebecca had a boy, it’s something that Quint will enjoy, and I can always use more boys! But it was also the only name I had for them that I thought fit perfectly. Now the Siew name will continue on for another generation. Caroline and Reed have a specific style of names, called ‘I will never use these, you can have them,’ or for short, boring. I have five cousins with the name of Alex, and between kids and dogs, I know an abundance of Molly’s too. Toby just seemed perfect. I aged him to take a peek and he’s actually *really* cute! He took the best features from each of his parents (aka no recessed chin), and I love that he has Caroline’s complexion for some family diversity. Linnea is darling, her chin is a bit of mystery, but I don’t really remember what her Dad looks like, he died literally years ago. So maybe it’s his, I just know it’s not Eva’s. And I’m really happy about Itzel too, I don’t remember what her birth parents looked like too much. Hector’s one and only post, so you can sort of see him… er I guess. Oh hey, both parents in this one… right before her Mom killed her Dad. (Goodness, I can’t believe the horrid quality of my old laptop). I did a percentage roll for sims to need glasses, finding that I wasn’t handing them out too often to the younger crowd. Itzel was one of the sims to get glasses. Ironically it also rolled for Myra, Mandy, and Isaiah and they already wear glasses! What are the odds?! They’re nearly the only ones that already do. Thanks for reading, and thank you for the support at N99, comments here, and on twitter, it was nice to know I wasn’t alone in the rebuild process, and to have someone to discuss it with. Looking forward to playing Hazel’s household next for Christmas. Thanks for commenting Starr, the only thing that really kept me motivated was the pregnancies, and finding out what everyone had. I can understand forgetting there were so many, it’s been a long time! I’m so happy to meet Wyatt and Toby! Especially Wyatt. They struggled so much to get pregnant and stay pregnant and I bet Quint was really hanging out for that boy. They have pretty much the perfect family now. Do you think they’ll ever try again? I love your birthing suite. I think I’ve said this before but it reminds me a lot of the room my friend and her husband stayed in after she had their daughter. It was a private hospital, so pretty swish! Can’t wait to see Grace and Eva’s babies! I can’t believe Linnea is a teen ether, she was the first baby born to my “new” system way back when I started this blog. I believe my very first blog post was Linnea’s kitchen birth actually, so it has been a long time coming, but her child years seemed to really fly by. Eva is getting old, she will be 46 when she has the new baby, and that is a little wild to me as well. I agree about Wyatt being extra special. I was actually displeased with Caroline getting pregnant again, being a pnpc and all, they are only supposed to have two. But Toby is cute so I’m more forgiving. He’s like a male version of Snow White. I feel that Rebecca and Quint are done with kids, I’m not doing any permanent measures on them, but I really hope they don’t have more. Their family seems perfect to me now. Thanks for the compliments on the birthing suite. I used the one I delivered my last baby in as inspiration, I’m nostalgic every time I open it for a birth, it’s one of my favorite lots to play with the new baby. It’s a little empty now with the loss of downloads. When I loaded the hospital there was tons of plastic balls all over the place, and apple statues. Your comment makes me wonder, do most share their hospital room with another in your area, even for the delivery part? They don’t really do that here, only if all the private suites are filled, but I’ve never heard of it actually happening. When I had my son, he was in the NICU, and I was allowed to even stay in my hospital room (rented like a hotel room) during his stay, there was talk that if it got too busy I’d have to leave to another ward, but it didn’t come to that. Hmmm, I have absolutely no idea about delivery but I’ve always assumed they had private rooms for it. That assumption is based on nothing though, because I’ve never asked! Hospital rooms after the birth can be private or shared. If you have private health insurance (most people I know do; it is additional to the universal health care we have here), you are pretty much guaranteed a private room, even in a public hospital. But the rooms in the private hospitals can be like hotel suites, while the rooms in the public hospitals are like…hospital rooms. You are making me remember Friends when Rachel goes into labor, and they share the labor room, but are wheeled off to deliver. Your health care and hospital systems interest me, it’s a big debate in the states, and everyone is always pointing to other countries plans, generally Canada, seeing it’s just north. That I was very unfamiliar with Australia’s health care. Our health care system is definitely closer to Canada’s than the US. I think it’s more common for Australians to also take out private health insurance though, as there are tax incentives to do so for high income earners (ie., those who are perceived to be able to afford it). There is some kind of incentive if you join before a certain age as well. Thanks for sharing all this information, it’s something I’m definitely interested in, especially with all the revamping going on with our health insurance here. So many countries do their health care different than ours, and people are all up in arms over any talk of change. When you talk of yours, or when I speak with my Canadian friends on theirs, it doesn’t sound terrible. I think every system has flaws/disadvantages, but I think our current one has the most. Thanks for chatting with me on this! It’s good to see you back. It’s crazy how many people are having sims trouble, hoping I’m not next! I was so excited to finally see Rebecca’s baby. But so many! You’ll definitely have a lot to do. I hope that you are not next for game problems! There is a ton of babies right now, but I’m excited about them all! Thanks for commenting Fini!